I love it when you’re listening to an old song for the very first time, thanks to some spectacular salvage operation, and think: “Wow! So that’s where so-and-so stole that motif from …”. Sometimes you get it straight away, and sometimes you’re still not sure. Is it coincidence it sounds similar? What I particular like is when the lift makes the lifter seem even cooler. Assuming they have been genuinely lifting. Having a Brazilian love affair this summer, I have been curling up with Gal Costa’s Legal set, among many others. It’s a mad and beautiful record, and her wonderful 'Archaic Lonely Star Blues' has been played over and over. This was partly because parts of it were naggingly familiar, and all I could eventually come up with was 'Changing of The Guard' from The Style Council’s Confessions Of A Pop Group lost masterpiece. It’s a lovely thought. Madeline Bell’s glorious 'I Can’t Wait To See My Baby’s Face' sounds a lot easier. It, ahem, rang a bell instantly. Well, I think so. I think it’s the source of that elizabethan bit in Saint Etienne’s 'Nothing Can Stop Us' anthem. I hope it is. It logically is. 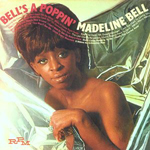 And anyway Bob Stanley had a hand in compiling the wonderful Bell’s A Popping set of Madeline’s ‘60s recordings just released by RPM. Now RPM has salvaged several singular sets, but this has to be their best (even better than Margo Guryan). It’s Brit femme-soul at its best, and some of the best music of the 1960s is contained on this collection. It’s the usual tragic story of coming so close to success, but time is kind to class. The set opener 'Picture Me Gone' comes roaring out the traps, and it’s almost all you need. But there’s better still. Her interpretation of the Lovin’ Spoonful’s 'Didn’t Want To Have To It' is exquisite, and perfectly understated. Another gem is 'I’m Going To Leave You', which was co-written by Madeline with Dusty Springfield and Lesley Duncan. This gives the perfect excuse to mention this holy trinity (along with Kiki Dee) formed a sort of ‘60s femme-soul Brit Wrecking Crew appearing on each others recordings, exploring new avenues of soulfulness, adventuresomeness, and sheer class. Lesley Duncan I have to quickly mention for anyone not familiar with her works recorded the best Brit variations on the Laura Nyro/Janis Ian theme, and her early ‘70s sets, Earth Mother and Sing Children Sing are gorgeous and need to be bought for the covers alone. Kiki of course we adore, and pray earnestly someone like RPM will salvage her ‘60s soul excursions and Motown magic. In the meantime if you buy one record this summer make sure it’s Bell’s A Poppin’. It should go some way towards gaining a very special lady the credit she is due. And come join me out on the floor shaking all my bits around in a gloriously undignified way to 'Picture Me Gone'.